"The 1000 Softcore Tourist People Club is fourteen tracks of mutant synthetic pop, blending virtual orchestra fantasies, cinematic soft disco, exotica tourism and digital lyricism. 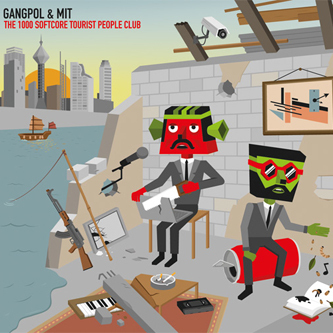 As a music and graphic duet, Gangpol & Mit have jointly developed since 2002 a peculiar universe of digital pop inhabited by colourful and geometrical characters. Their sonic and visual world find its roots and echoes the humour of duos like Yello or Sparks, hybrid arrangements of the French Francois de Roubaix, and narrative sides of cartoon and graphic novel classics, occasionally re-appropriating moods and tips from many adventurous music styles: digital cumbia, shibuya-kei, synthetic funk or disco dangdut."